Sometimes while photographing, we arrive at a grand scene offering so much beauty that causes us to – rightfully so – feel quickly overwhelmed. To overcome this unsettling sensation, I tap into mindfulness techniques as a way to become more aware and connected with our surroundings (as some of you have experienced while participating in my photo workshops). When I intentionally slow myself down to express curiosity and gratitude for my surroundings, the process oftentimes leads to a “flash of perception” experience, or in other words, a moment where I say, “WOW, look at THAT!” When I catch myself saying this (especially if I say it aloud while alone! ), I know instantly it is my cue to break out the camera gear and start creating a photograph. Without further exploration and definition, though, the “THAT” is difficult to bottle up and stuff into a rectangular frame successfully. To help provide additional guidance to my compositions, I will frequently title my image before I snap the shutter. If I have trouble condensing my thoughts into a short title, I will simply talk through what I am seeing, focusing on the shapes, colors, lines, forms, etc. grabbing my attention. As I outline my thoughts, I pay close attention to the words and concepts I can express photographically. In May 2015, at the Moab Photography Symposium, a frequent attendee and fine photographer introduced me (and eventually the entire audience) to his favorite way to connect what he sees with what he feels – a haiku – a technique he learned from famous photographer Eddie Soloway. Using the traditional haiku form of three lines (the first and last lines requiring five syllables and the second, seven), a photographer describes what you see in the first two lines and then how you feel about it in the final line. Having a great interest in poetry myself and having created haikus before in a different context, I immediately gravitated towards this new idea so relevant to photographers trying to understand their surroundings and ultimately, express their thoughts in pixels. I’ve not only incorporated this process more regularly into my own photographic pursuits, but I now also offer it to my students during my photography workshops as another option for expressing what we observe. In fact, I put the practice to recent use on my photographic outing last week. While hiking one afternoon among the gigantic granite spires in City of Rocks National Reserve in southern Idaho, I came upon a meadow full of summer blooms – rabbit brush, yellow salsify, asters, and more – interspersed among the junipers and sage brush. I spent a few minutes simply admiring summer’s abundance – and my fortunate opportunity to see it. After observing for awhile, I noticed a small dandelion seed head off on its own in a small clearing in the middle of the busyness. I walked over to inspect more closely. Having recently photographed a similar, but much larger subject – the yellow salsify seed head – in the Henry Mountains this past July (see photo “Joy in the Little Things” on the right) and again along the very trail I was hiking before reaching this meadow, I knew I wanted to get my lens as close as possible to study the intricate details of this smaller, but equally exciting, specimen. To do so, I grabbed my 100mm macro lens and two 12mm extension tubes. 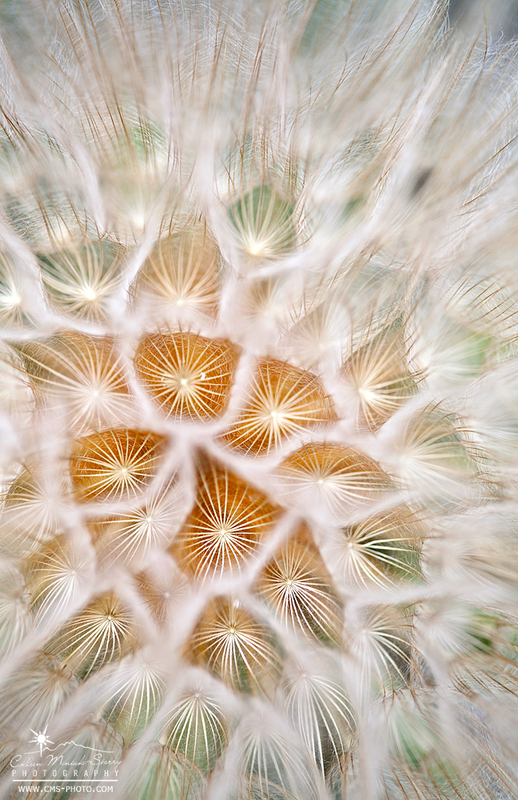 I came up with “What Lies Within Counts” to reference not only the dandelion within the larger context of its existence in the field and it’s relevance to life in general, but also the heart-like shape I saw (which is the shape of the out-of-focus bracts of the dandelion) that offset the bright white radiating shapes. With the title and haiku as my guides, I tested a number of different compositions to fulfill these notions. 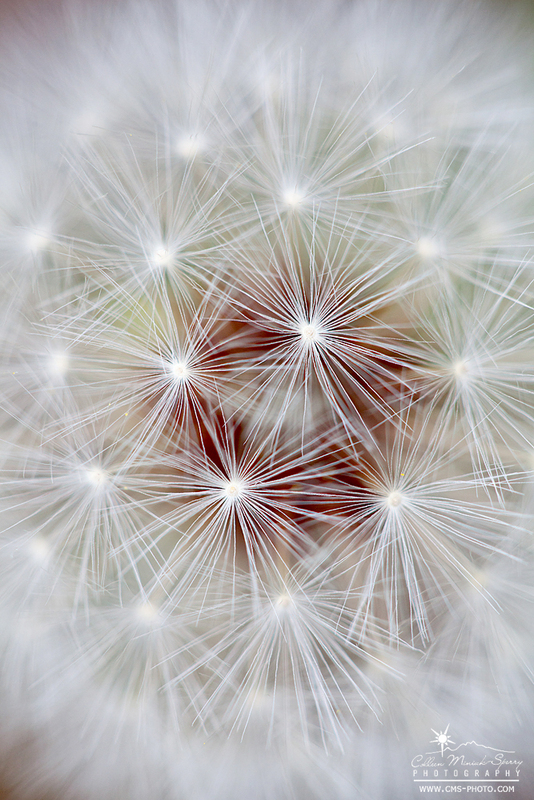 I eventually settled on placing the dandelion bracts as off-centered as possible to create a sense of asymmetrical balance while keeping the flower itself centered in the frame to allow for a natural vignette to occur (which is simply the edge of the flower appearing against the ground, blurred by a wide f/2.8 aperture setting). Because of a substantial, but irregular breeze, I bumped my ISO to 800, which yielded a fast enough shutter speed (1/500th of a second) to help freeze the dandelion as it swayed in the meadow. In addition to waiting for the breeze to calm momentarily, I also waited for a cloud to pass in front of the sun to turn the harsh, contrasty mid-day light into more pleasing, softer diffused light. As I packed up, I still noodled on the title and tagline of the haiku as it related to photography. In order to make our personally meaningful nature photographs, I certainly believe “what lies inside [the photographer] counts.” By paying attention to our individual backgrounds, experience, knowledge, and interests – all the things that drive you to you say “WOW, look at THAT!” – leads to more consistent success and satisfaction in the image making process. When I decide where to travel to create my own photography (versus shooting on assignment), I often try to mix up my time between visiting old favorites with new locations. Because of my deep connections and ongoing fascinations with my favorite places, I feel not only comfortable and relaxed in these spots, but I also find endless stories to tell about them. In these places, it feels like I’m coming home to a plateful of freshly-baked, warm, gooey chocolate chip cookies. And those who know me know very well that I am not capable of resisting freshly-baked, warm, gooey chocolate chip cookies (or any cookies for that matter…). At the same time, though, I love the thrill of discovering and exploring all the new surprises a completely new location offers. It’s like opening presents on my birthday or at Christmas. Every time I look or pick something up, it offers me a chance to learn something new about the place or a subject - and quite often about myself. This past May during my three-week adventure in Oregon, I balanced my time between old favorites – the coast, specifically Carl Washburne and Cape Lookout state parks – and a new place – Succor Creek State Natural Area. Not only did I chose the Succor Creek area because I had never been there before, but also because it promised water in the high desert (a juxtaposition that never ceases to intrigue me) along the eastern border Oregon shares with Idaho. After about an eight-hour drive from Portland, I arrived to the tree-lined oasis and set up camp. For four blissful days, I enjoyed hiking along the water’s edge, marveling at thunder eggs (Oregon’s official state rock), and watching the light dances on the rhyolite cliffs surrounding me in my temporary “home.” Ever corner I turned, a new sight, scene, smell awaited – oh, the joy! 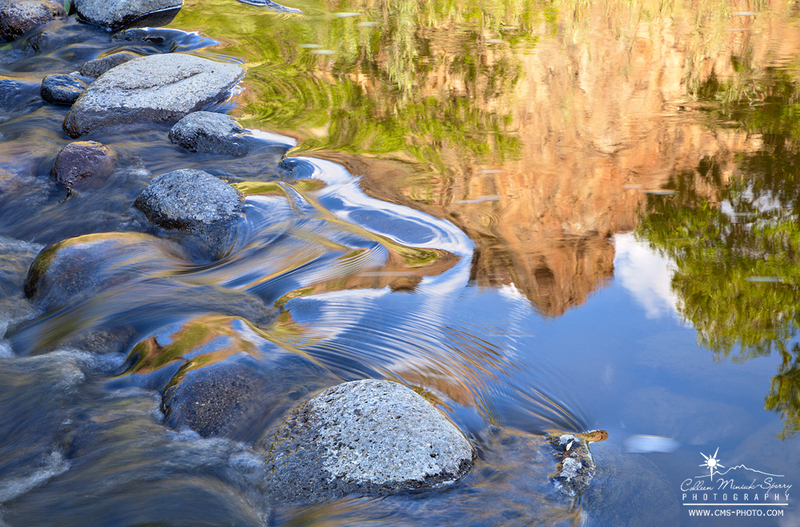 From my camp, I could hear the water gurgling and tossing against the rocks all day and all night. As I listened, I wondered what it would be like to be that water – Where has it been? Where is it going? And why? I started to pen words answering these questions and internalizing the idea of an unknown journey within myself. Where had I been? Where was I going? And why? I smiled when I realized Succor Creek was living up to its name. By definition, the word “succor” means “help; relief; aid; assistance” according to dictionary.com. As I polished the draft of my poem, I glanced up to notice a beautiful reflection glowing on top of the water’s surface while sitting in camp late in the afternoon on the day prior to my departure. Harsh sunlight bathed the entire scene, but I had learned enough about this location in the days prior to know if I waited an hour or so, the creek would fall into shadow (thanks to the sun dropping behind cliffs to the west of me) and create a desirable contrast to the still-illuminated cliffs to the east of my position. I headed to the creek with my camera and tripod in hand anyhow to perfect my composition so that I could be ready as soon as the light fell into place. While watching the reflected light pour over the riffle, I decided to title my forthcoming photograph, “Drifting From Reality.” I intended to create a composition with a slow enough shutter speed to create a “silky” effect mentioned in my poem. I also wanted the water to appear as if it were melting the cliff’s reflection in the water into the “stoic stones” on the left side of my frame. I settled on ISO 100 and f/22 to slow my exposure down. I waited until the bright light receded in order to get a final shutter speed setting (1/4 second). The photo above resulted.